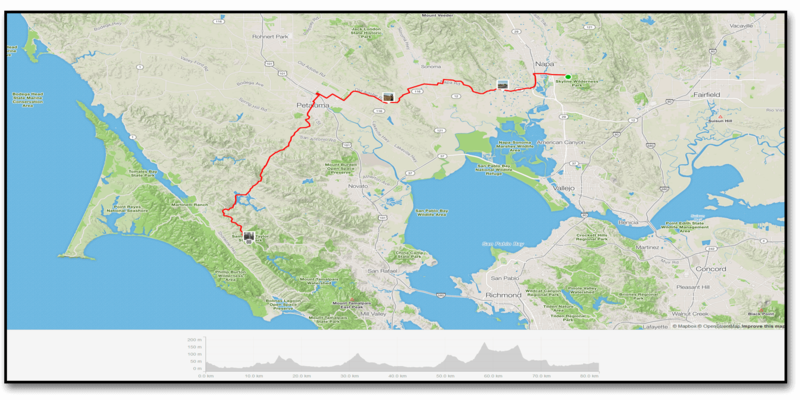 Day Thirty One – Napa to Samuel Taylor State Park , California. Another long day in the saddle as we transit 82 km to Samuel Taylor State Park, one of the oldest parks in the US. This park is nestled in the majestic redwoods of the west coast of California and it is one of the first places we have just biked into with no reservations and gotten into the communal hike and bike spots. We met a nice young couple from Austria who are biking from Seattle to LA and a biker dude who lives in the Bay area and just basically travels around and was on his way home after biking through Oregon. The atmosphere is pretty laid-back as people just share their stories. Tomorrow we are off to a hostel in the Marin Headlands above San Francisco in preparation for Saturday’s big transit through the city by the bay to the other side and on down the coast. Another hot day in California. You have to keep hydrated – or you die. Hey look it’s the Carneros winery. Nice hike and bike area at Samuel Taylor. Jon chats with the biker dude.